Silver Spring, Md. (Wednesday, March 20, 2019) – Novo Nordisk, a global healthcare company, and Discovery Education, the leading provider of digital content and professional development for K-12 classrooms, today announced the Super Health, Super You Community Health Challenge winners in celebration of thriving, healthy and active school communities across the United States. The Super Health, Super You Community Health Challenge, designed to help elementary school teachers incorporate healthy lifestyle education into their curricula, inspired elementary school students to develop new ways to help their school’s community healthfully and holistically flourish. Challenge winners were selected by local educators, Discovery Education and Novo Nordisk across three categories, and have successfully demonstrated fundamental community health concepts in their submissions. Three Super Health, Super You Community Health Challenge schools, in California, North Carolina, and Texas, today were awarded $10,000 each to implement forward-looking healthy lifestyle solutions for their communities. 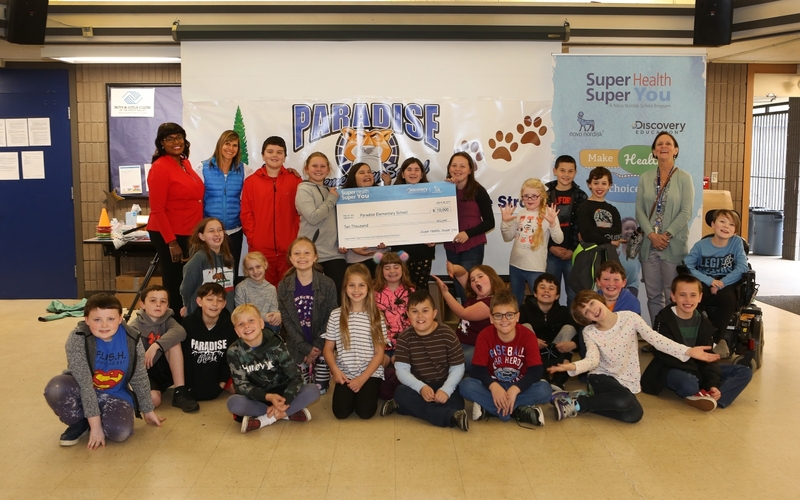 The Grand Prize Winner, Paradise Elementary School, will also be nationally recognized by Novo Nordisk and Discovery Education during an in-school assembly. Super Health, Super You resources are accessible online and within Discovery Education Streaming Plus, an award-winning comprehensive digital service supplementing instruction across all K-12 curricular areas. Discovery Education Streaming Plus empowers educators to create dynamic learning environments that mirror students’ use of technology outside the classroom. To introduce students to a new world of nutrition and health, Fields Store Elementary School will use their prize to start a school garden club, Kids Dig’in Real Food (KDRF). Their 2019 goal is to encourage kids to eat more fruits and vegetables by providing access to fresh organic foods. KDRF will be comprised of Fields Store Elementary students, parents and faculty who will work together to accomplish their goal. Tri-County Christian School students aim to improve health and fitness in their community by creating a safe environment for young learners to access physical education, while strengthening their bodies and having fun. The student body will leverage their Super Health, Super You Community Health Challenge award to build a physical activity space for youth 12 years old and younger, with the aim of establishing healthy lifelong fitness habits among youth. The Paradise Elementary School community plans to access SEL curriculum and purchase playground equipment with the goal of helping local students manage the trauma of losing their school building during a recent Camp Fire in Butte County, Calif. The Rebuilding Paradise initiative will help Paradise Elementary School students, educators and parents rebuild and refurbish their school community in a healthy, loving and positive way. The Super Health, Super You program activates schools to think critically about the health and wellness of their student population. Exercises and activities present fundamental community health concepts, and the program’s online hub houses downloadable content about diabetes prevention, fitness, nutrition topics and latest news regarding the Community Challenge. Lesson Plans and Activities: Six lesson plans and seven activities are available for upper elementary school students to highlight community health, including: addressing external factors contributing to health, and the relationship between food choices and diabetes. Family Toolkit: To extend the learnings beyond the classroom, a family toolkit comprised of three community-health based family activities and one family health discussion prompt. Super Health, Super You resources are available at no-cost at superhealthsuperyou.com and are integrated into Discovery Education Streaming Plus. For more information about Discovery Education’s digital curriculum resources and professional learning services, visit discoveryeducation.com. Stay connected with Discovery Education through social media on Facebook, Twitter, Instagram and Pinterest @DiscoveryEd. Novo Nordisk, a global healthcare company, has been committed to discovering and developing innovative medicines to help people living with diabetes lead longer, healthier lives for 95 years. This heritage has given us experience and capabilities that also enable us to help people defeat other serious diseases including obesity, hemophilia and growth disorders. We remain steadfast in our conviction that the formula for success is to stay focused, think long term and do business in a financially, socially and environmentally responsible way. With U.S. headquarters in New Jersey and production and research facilities in five states, Novo Nordisk employs nearly 6,000 people throughout the country. For more information, visit novonordisk.us, Facebook, Instagram and Twitter.